Cheap Wedding Favors Wedding favors are small gifts given as a gesture of appreciation or gratitude to guests from the bride and groom during a wedding ceremony or a wedding reception. As sugar became more affordable, bonbonnieres were replaced among the modest with almonds. For centuries, almonds were commonly distributed to wedding guests to signify well wishes on the bridegroom's new life. In the thirteenth century, almonds coated with sugar, known as confetti, were introduced. Confetti soon transformed to Jordan almonds, which later evolved into the signature wedding favor for modern day weddings. Traditionally, five Jordan almonds are presented in a confection box or wrapped in elegant fabric to represent fertility, longevity, wealth, health and happiness. The bitterness of the almond and the sweetness of the coated candy exemplify the bitter sweetness of a marriage. Today, gifts to guests are commonly known as wedding favors and are shared in cultures worldwide. Wedding favors have become an intricate and necessary part of wedding planning and have complemented ceremonies and receptions alike. Wedding favors are so diverse in style, elegance and theme that options for favors are only limited to the couple's imagination. Today's bride has the option to select a gift based on her wedding theme. Many couples wish to share commemorating gifts that are personalized with the couples names and dates so the guests can remember the very special occasion. Some of these favors include personalized pens, wedding flowers, trinket boxes, goblets, candles, vases, and even personalized wedding cameras. These gifts have made the bride's 'to do' list and climbing the list as a very important item. The importance and demand for wedding favors have created new business in the wedding industry. Wedding favors have surpassed the term 'trend' and have become commonplace among today's weddings. Jordan Almonds ~The slightly bittersweet taste of raw almonds is coated with the sugary goodness of the candy coating, bringing with it a hope that the new life of the bride & groom is more sweet then bitter. Other traditions say that almonds should always be received in odd numbers so that it can not easily be divide. Once again representing the new found life of the couple. Dried Fruit Wedding Favors ~ Representing the bounty of a full harvent or life, Dried Fruit is a wonderful way to say thank you to your guests for taking time to be with you on your special day. Perfect for Outdoor weddings as well as appropriate for weddings in Spring & Summer. A simple Tulle & Ribbon bag in your bridal colours make a beautiful presentation. Picture frame wedding favors, ideal for a wedding favor.Picture Frames ~ Many couples give picture frames as gifts. These frames may be placed in a mixed favor bag, also used as placeholders/seat assignment placards, as part of a centerpiece, or individualized for each guest (usually containing a picture of the couple and the guest). These frames are generally no larger than 4x6, but some couples opt for larger frames- especially if they are also using them as centerpieces. 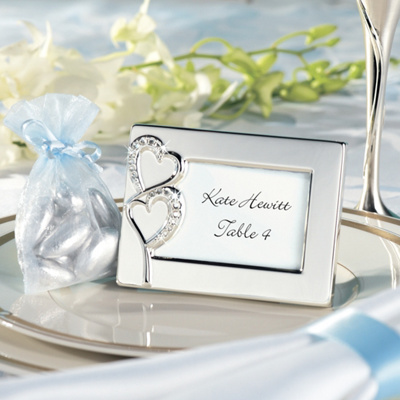 For more information on incorporating favor frames as placards, see the seating assignments page. Photo albums wedding favors ~ Small photo albums also make great gifts, especially for small weddings and family-centered weddings. Couples may wish to place one of their engagement pictures inside, or a small personalized note thanking the guest for attending. Bells and other noisemakers wedding favors ~ It is a long-standing tradition to have guests receive wedding bells as favors. Traditionally, whenever a guest rang the bell the couple would have to kiss. Many couples like to put the tradition of the wedding bell ringing on little cards to go with the bells. In modern times, there are also other noisemakers that can be included as wedding favors such as flutes, horns, and clappers. Candles Wedding Favors ~ Candles have been a popular gift to guests for many years. They may be of any size, shape, or scent. Many couples use votive candles and have them in decorative holders. There are also specialty candles such a wedding cake-shaped candles in a scrumptious buttercream frosting scent. Some couples will make their own candles to give to guests. Candles may also be places as part of a mixed favor. If there is a unity candle ceremony involved, the couple may give smaller replicas of the candles used as favors. 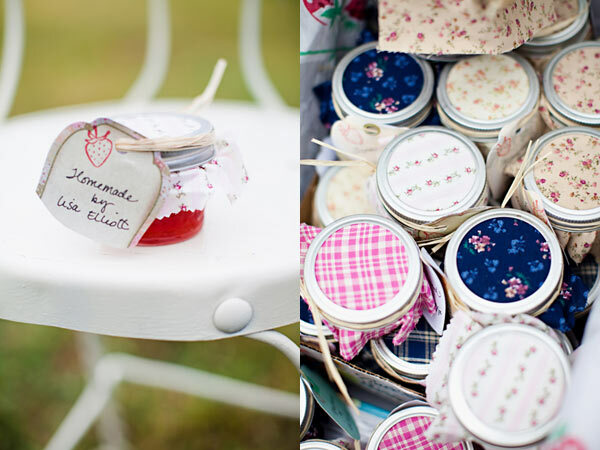 Homemade Jams, Jellies, or Preserves Wedding Favors ~ If you make your own jams, jellies, or preserves you may want to share you talent with your guests. 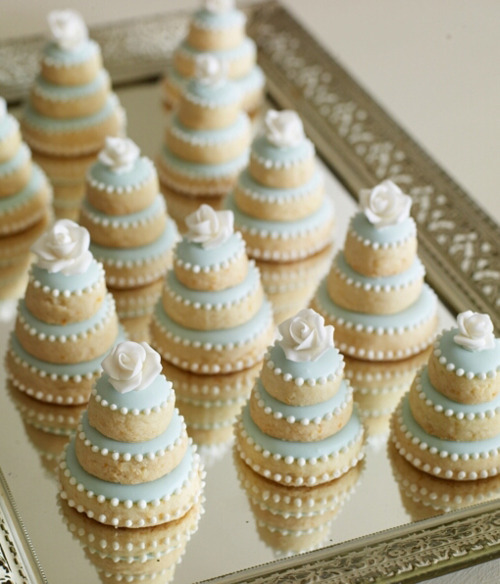 These tasty favors often last a lot longer than candy or other edible favors. If you're having a destination wedding, you may want to consider this favor as well. That way your guests can bring a taste of the destination home with them. Candy Wedding Favors ~ One of the most popular and widely used favors is candy. Candy is very versatile and there is truly something for everyone. 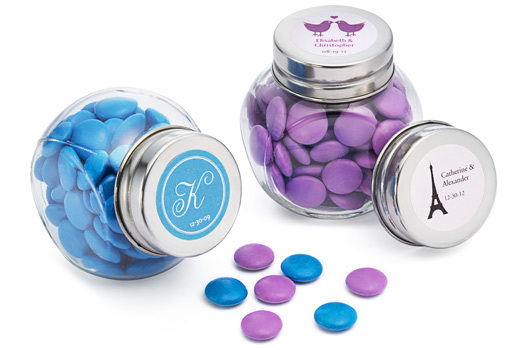 Many couples buy candy to match their wedding colors. Candy can be put into mixed favors, put inside placards, used as part of centerpieces and table decorations, and be made into other types of favors (e.g. tulle candy roses). Many types of candy can also be personalized with the couple's names- either on the candy itself or on the wrappers. Chocolate cigars are popular favors representing the groom. An example card for charitable donation favors, from The I Do Foundation.Charitable Donations ~ If you and your guests are particularly socially-conscious, you may want to consider using your favor budget to make donations to charities in the names of your guests. A small certificate can be handed to each guest explaining the donation and thanking them for attending the wedding. Bookmarks Wedding Favors ~ A quick DYI project for any computer savvy bride! Create a 7 column-landscape layout on your favorite word processing software. Add the the names of the bride & grooms, the location & date and a special poem or saying(usually what you used on your invitation). Save your document file to a disk or flash drive and take it down to your local stationary or copy store(i.e. Kinko's or OfficeDepot) Pick out 8x11 card stock in the color of your choice and have your book marks printed. Most stores will have a paper cutter you can use to separate the book marks. Bath & Body Products Wedding Favors ~ Some creative couples may wish to make their own bath & body products. These are especially nice for bridesmaid gifts. The couple may make their own and create a personalized scent, give pre-existing products, or give personalized products. These products are perfect for gift baskets. Tea and Coffee Samplers Wedding Favors ~ If you and your partner are into tasty beverages, you may want to consider tea and/or coffee sampler packets. This is a great favor that can be enjoyed at the guest's leisure and also help share some things you like with your guests. Hot cocoa, spiced cider, and other beverages also make good favors. Liquid bubbles wedding favors ~ Many couples choose to use blown bubbles as a way for guests to send the couple off after the reception. These also make great favors for guests to take with them. Many companies offer bubble containers in fun shapes (hearts, champagne flutes, champagne bottles, wedding cakes, etc.) and many also are able to be personalized with the couple's names and their wedding date. Personalized items wedding favors ~ In addition to liquid bubbles, many other items are able to be personalized. Pens, glasses, and small personal items (keychains, money clips, clocks, etc.) can be personalized with the couple's names and usually the event date as well. This gives guests a nice item that is a distinct reminder of the event. Kitchen/bar accessories wedding favors ~ It is becoming more and more popular to have small kitchen and/or bar accessories as gifts. Bottle stoppers, corkscrews, measuring sets, drink shakers, coffee accessory kits, divets, and coasters are just a few examples of such gifts. Many couples opt to personalize these with their names as well. These gifts are especially popular among couples who have more mature guests. Small plants Wedding Favors ~ Some couples decide to give their guests a living gift, such as small plants that are native to the area where the wedding takes place. This is an especially popular gift for destination weddings. The plants are often arranged as centerpieces on the tables, with small notes at each place setting inviting guests to take a plant with them. Favor Bags ~ Favor bags are one of the most popular types of wedding favors. Generally favor bags include several types of favors. Favor "bags" do not even necessarily need to be bags- they can also be boxes, shadow boxes, cartons, or any other type of container. Couples usually opt to include favors that hold significance for the couple. Out-of-town Guest Packages ~ Couples with large wedding budgets and/or destination weddings often prepare guest packages for their out-of-town guests. These favors are generally placed inside the hotel rooms of the guest, waiting for them when they arrive. The couple generally brings these and a list to the hotel the day of the guest's arrival so the cleaning staff may place it in the room. These packages generally contain items unique to the wedding venue's area, and often maps of the area.